In the June 6, 2012 Google Alert for Talking ATMs came a news report, posted below, of the “first” Talking ATM in India. It was not the first time the Indian press covered accessible ATMs though. In September 2011 the Hindu Business Times reported on the experience of using a Talking ATM for the first time, but on closer read last Fall’s story may just have been describing temporary installations. Whether or not Union Bank of India has installed the first or second (or 1,000th) Talking ATM, congratulations go out to advocates in the Indian blind community and that country’s banking industry for recognizing the importance of accessible technology. AHMEDABAD (June 6, 2102) India’s first “talking” Automated Teller Machine (ATM) for visually impaired was today inaugurated in Ahmedabad. The ATM by the Union Bank of India is first-of-its-kind for the visually challenged and 4000th in the countrywide network of the state-run bank. The foundation stone of Union Bank building in Mumbai had been laid by Mahatma Gandhi. I am happy that the first accessible ATM is being started in the state of Gujarat, janambhumi and karambhumi of Gandhi. 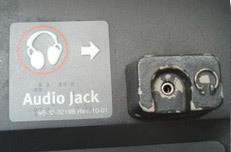 According to BPA functionaries, the users have to plug-in a headphone into the ATM which has a unique voice interface, and once it is done the machine guides them into further operations. The ATM can also be operated by wheelchair-bound person as well. There are about 20,000 blind persons in Ahmedabad and they can use this ATM to the fullest extent. This ATM can be used by general public for transaction, the BPA said.